"Spa-Chiladas" & I Won the Goddess Giveaway! I was pretty excited ALL day for dinner tonight ~ Basic Black Beans and Chicken/Spinach Spa-Chiladas. What I LOVED about this recipe was you didn’t have to heat your oven or cook it for that long. I have to apologize ahead of time as I was sorta frumpy making up dinner tonight. I think feeling like I need another me to get everything done and being a bit sleep deprived isn’t a good combination for me. All blended together – that’s it! It was so tasty and reminded me of a fruity drink you’d get to sip on the beach while on a tropical island. I will definitely whip this up again. Dinner was sort of a good flavored flop tonight. What I’d change is making my “enchilada” sauce thicker and I’d “fry” up the tortillas first. Take 1/2 of all the above ingredients and place in a sauce pan. Cover with about 1 – 1 1/2 c water (I used 2 c and I think that was too much). Cook for 12 minutes or until the tomatoes are softened. Blend and return to the pan. You can use pre-cooked rottiseuirrie chicken, boil chicken breast or grill it! I grilled up 2 five oz chicken breasts with a little garlic salt and pepper. Chopped and place in a boil. Place spinach in a microwave safe dish with 2 Tbsp water. Cook for 2 minutes, remove drain and place in the chicken bowl. Add a few spoonfuls of the “enchilada” sauce to the spinach chicken mixture. Dip your tortillas in the sauce and place on a plate. Top with a scoop of beans and a scoop of chicken/spinach. 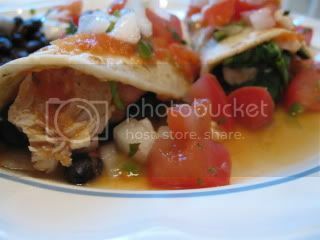 Fold in half and top with additional sauce and/or Salsa Mexicana. You can serve additional black beans on the side. 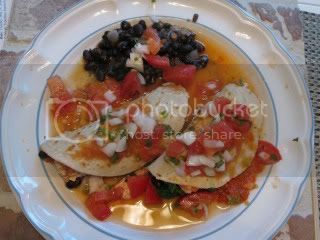 I had 2 SpaChiladas stuffed with all of the above (minus the avocado) – I would’ve LOVED that! In other SUPER COOL NEWS – I have TWO much anticipated giveaways in the works for you all. I am planning one to start on Monday and the other is lined up for the week we are in Vegas. I guarantee you will want to WIN both – yahoo! Speaking of Giveaways ~ I won ANOTHER GIVEAWAY today! C.G. Foodie hosted a fabulous “Goddess” Giveaway and I won!!! Woohoo ~ I can’t wait to learn how to Belly Dance – Thanks C.G.! I am soooo playing lotto tomorrow – TWO giveaways in one week – woohoo! Alright, please forgive me for being behind on your blogs. I promise to catch up soon – for now, I will catch up on your comments and get to bed early to catch up on some much needed sleep. Have a great night all ~ I am soooo glad tomorrow is Friday! That pineapple drink sounds so good! SO healthy and perfect for hot summer days. I bet cantaloupe or strawberries would work well too. YUM! yay for winning the giveaway! congrats on the goddess win! 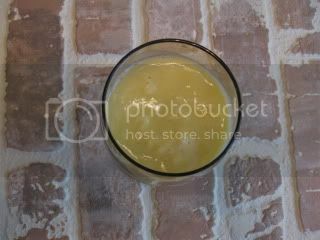 I love your pineapple drink! It looks so simple but refreshing. I just realized yesterday that our ice machine is broken, so I'm working on getting it fixed (or just being old-school and using an ice tray) soon! Those enchiladas look like something you'd get at a restaurant! Yum! We had the same enchilada sauce experience! I was really annoyed as well. We ended up mixing up everything with some spicy salsa for a good kick in pants. I didn't puree my beans either. I never want to PUREE again! Heh! Your "cocktail" looks so good! way to go, that's always fun news to receive! congrats on the giveaways – lady luck must've been on your side for sure! Congrats on winning the giveaway!! Speaking of giveaways, I'm having one on my blog now, so please check it out when you can! I hope to win something eventually too.. haha. Health ~ Ohhhhhh…strawberries would be fantastic – I need to try that! Julie – No problem, I'd love to know what you think if you make any of the recipes and like them. Brandi ~ Thanks – I think they could be fantastic with a thicker tomato sauce. K ~ You definitely need to try the pineapple frap – I know you'd dig it. Angelea ~ I gave The Husband the first batch that didn't fold right 😀 hehe. I was wishing my mocktail had alcohol last night for sure! 3 more days – woohoo! Runtofinish ~ Thanks – I am excited to try it all out!